John Lewis Krimmel (1786-1821), a German-born painter who traveled throughout the Mid-Atlantic region from his base in Philadelphia recorded items and activities in daily life. This page from his sketchbook illustrates household metal and ceramic wares and offers a visual reference for our exhibition. Notice the japanned tea canister in the upper center, a pierced conical lantern, and a rectangular spice box like the objects on display. Blinn, Leroy J. A Practical Work-Shop Companion for Tin, Sheet-Iron, and Copper-Plate Workers. Philadelphia, Pennsylvania: Herny Carey Baird & Co., 1902. A Book of prices of Journeymen’s Wages for MAKING TIN-WARE agreed upon by the Master Tinplate Workers of the City of Philadelphia at a meeting held the 18th of April, 1796. Philadelphia, Pennsylvania (no publisher), 1796. Brazer, Esther Stevens. Early American Decoration. Springfield, Mass. : Pond-Ekberg Co., 1940 and 1961. Butts, I. The Tinman’s Manual and Builder’s and Mechanic’s Handbook. Boston, Mass. : I.R. Butts & Co., 1860. Jones, Yvonne. 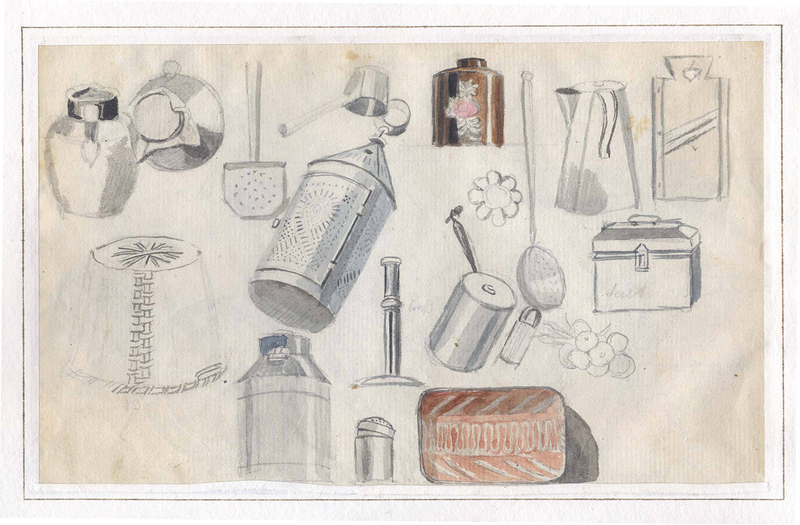 Japanned Papier Mache and Tinware c. 1740-1940. Woodbridge, U.K.: Antique Collectors’ Club, 2012. Martin, Gina and Lois Tucker. American Painted Tinware A Guide to Its Identification, vols. 1-4. Cooperstown, New York: Historical Society of Early American Decoration, Inc., 1996-2007. Quantrill, Thomas H. The Mechanic’s Calculator and Tinman’s Guide. Washington, D.C.: Thomas Quantrill, 1847. Wagner, Ann K. “Pierced, Punched, Painted: Decorated Tinware from Winterthur,” in Brandywine River Museum Antiques Show Catalogue, Chadds Ford, Pennsylvania: Brandywine River Museum, May 2012, pp. 5-12. Wagner, Ann, with Mary McGinn and Lauren Fair, “Scratching the Surface of American Painted Tinware,” in Antiques & Fine Art, vol. xii, no. 2, (Autumn/Winter 2012), pp. 189-191.